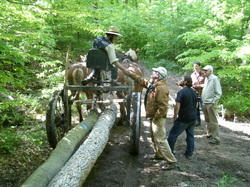 Biological Woodsmen's Week 2013 will be held in Floyd County, Virginia this year, at the Wall Residences Eco-Village. The dates are the 19th through the 23rd of November. 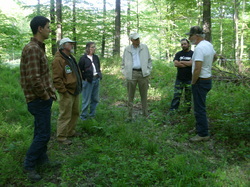 Each day there will be Restorative Forestry practiced in several forms at multiple locations, This work will be done by HHFF trained and associated Draftwood Forest Products - Biological Woodsmen. The primary location for active management will be the Eco-Village woodland. This site will demonstrate the advanced Timber Stand Improvement (TSI) that will be practiced to restore an old abandoned Christmas tree plantation into a more natural mixed species of trees that releases the best individuals to grown to a mature Appalachian Forest. This is frequently the condition of forestland in many parts of our community. We are developing other locations in the community for the demonstration of Restorative Forestry in existing mature forested settings. Visitors during the week will have options of sites to visit or visit them all. On Friday the 22nd, at 7:00 pm, in the Floyd County High School auditorium - Wendell Berry will speak and then join a panel of national experts to discuss the issues of our forests and communities. Note cards will be passed out for questions presented though our moderator, Ethan Mannon. Panelist are Wendell Berry, Carl Russell, Earthwise Farm and Forest, Randolph, Vt., Guy Dunkle, Forester and land manager for the Foundation for Sustainable Forest, Titusville, Pa. and Jason Rutledge co-founder of HHFF, the original Biological Woodsman. . Advanced tickets sales information below. Saturday the 23rd there will be a Woodsmen's Play Day at the Floyd Eco-Village site featuring, timber felling contest, Draft Horse Demonstrations and a friendly Draft Horse Pulling Contest. Advance sale tickets are available by mailing a check ($10.00 each) to the HHFF office and picking them up at the "will call" desk at the door of the auditorium. You may also buy them at the Floyd Eco Village website and Sustain Floyd web site through pay pal and credit card.